This class is for children that turn 2 years old before August 1. Students will not need to be potty trained, but should be in the process. 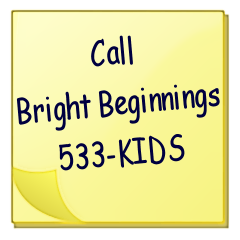 Children enrolled in the Brainy Bunch extend their day at Bright Beginnings by one hour. This program includes Fine Arts enrichment activities and catered lunch or snack. Please call us for more information.